Both the Amalfi Coast and Tuscany can offer you an escape by the sea, but which region is for you? This guide showcases the best of both! How do you choose between the Amalfi Coast and Tuscany? 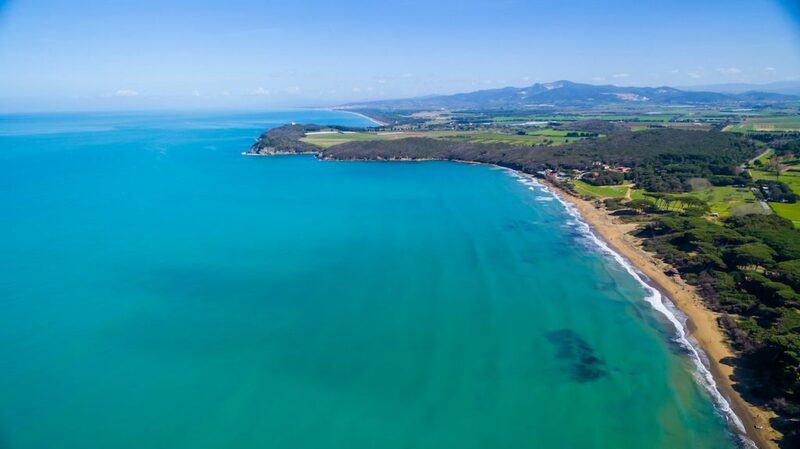 The first destination boasts a spectacular 50-kilometre coastline with sea-facing bluffs, beach coves, soft-hued fishing towns, vineyard rows, and lemon groves. The other is home to iconic Renaissance art, architecture, the lofty rugged peaks of the Apennine Mountains, sandy island shores, olive groves, and Chianti grapes. The Amalfi Coast and Tuscany are ideal for an Italian escape in the countryside or by the Tyrrhenian Sea, but each region offers an entirely different travel experience. Discover which destination is right for you! Renowned for idyllic cliffside towns, hypnotizing blue waters, and intricate paths and passages, the Amalfi Coast in Campania, Italy is one of the most inviting regions in the world. In 1997 it was named as a UNESCO World Heritage Site after being deemed an outstanding stretch of Meditteranean landscape. If you want to be treated to southern Italian hospitality and spend your vacation sipping a spritz by the beach, hiking along one of the most incredible walking trails in the world, and watching sunsets over the Bay of Naples, then this destination is probably for you! Taking into account the allure of the Amalfi Coast, during the summer months you’ll find droves of people. To make the most of your trip, skip peak season by opting to visit during spring in May or from September to October. The weather will still be warm, and you won’t have to deal with the overwhelming crowds. See Also: Amalfi Coast vs Santorini: Two Idyllic Destinations, Which One’s For You? Despite being the capital of the Amalfi Coast, it’s possible to walk through pretty Amalfi from one end to the other in under half an hour. Sun-filled piazzas and small beaches are the town’s treasures along with the Duomo di Sant’Andrea Apostolo. Pick up some pastries from one of the shops in the main square and grab a spot on the steps of this 9th-century Roman Catholic structure to eat your treats. The local shops are brimming with local crafts and goods, perfect for a souvenir or two! 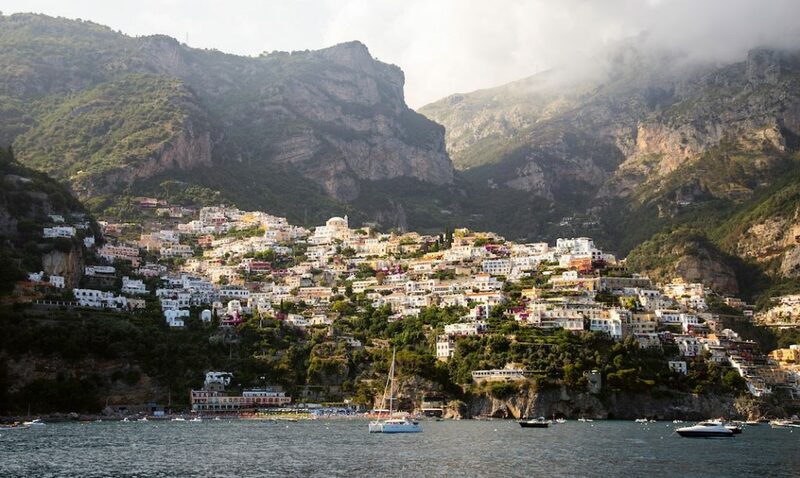 There are many gems along the Amalfi Coast, but Positano shines. There’s a mythological tale in which Poseidon, the God of the Sea, is said to have created Positano as a gift for a nymph he loved. Tucked away in hills that lead down to the coast, this magical town is bursting with charm. Spend your day swimming in hidden coves, taking in the unbelievable views from the Path of the Gods, and discovering the town’s history. Most people hop on a boat for a day trip to the luxurious island of Capri, but the fragrant lemon trees and the lush Mediterranean sun will probably make you want to stay longer. Any amount of time spent on Capri is enchanting, but make the most of it by swimming in the Blue Grotto, sauntering along the miles of wild hiking trails and walking paths and living your best life with a cocktail at a private beach club. 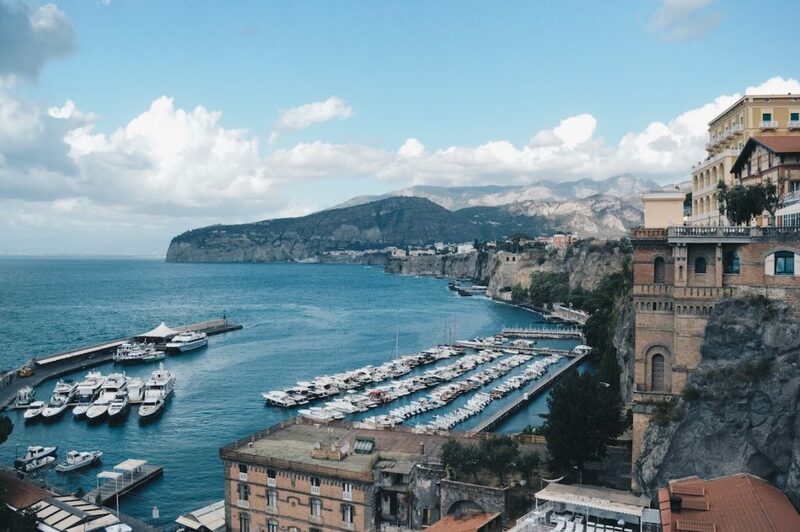 Many people make Sorrento their base when exploring the Amalfi Coast because it’s well-connected by boat, train, and bus, especially in the summer. 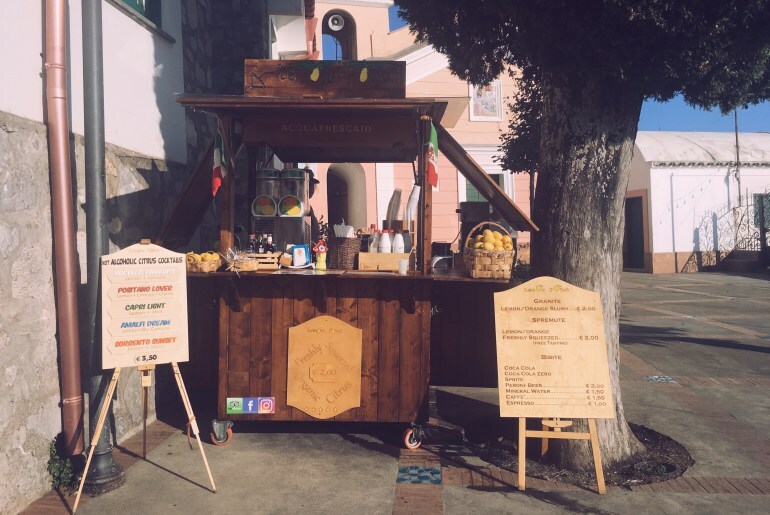 The market lanes of this charming town are a great place to lose yourself, there are lots of restaurants by the seaside promenade for a cozy bite to eat, and you can even watch the sun disappear into the Bay of Naples from the secret beach of Bagni della Regina Giovanna. High above sea-level along the Lattari mountain range, Ravello’s vistas are a sight for sore eyes. For a quintessential fairytale vacation experience, walk from the Piazza Duomo to the Piazza Fontana Moresca. Along the way, you’ll see rows of crumbling mansions and villas, churches from centuries ago and majestic hotels where visitors may run into the rich and famous. Ravello’s pedestrian-only laneways are made for wandering, and the gardens at Terrace of Infinity are also a must-see! From sapphires to emeralds, the waters surrounding the Amalfi Coast take on shimming shades, and the sea by Grotta dello Smeraldo is a light green. This impressive 100-foot-tall coastal cave was carved into the towering bluffs over the years by the sea. You can’t leave this region without taking a dip here and witnessing the power of nature. The Path of the Gods is one of the most breathtaking walks. 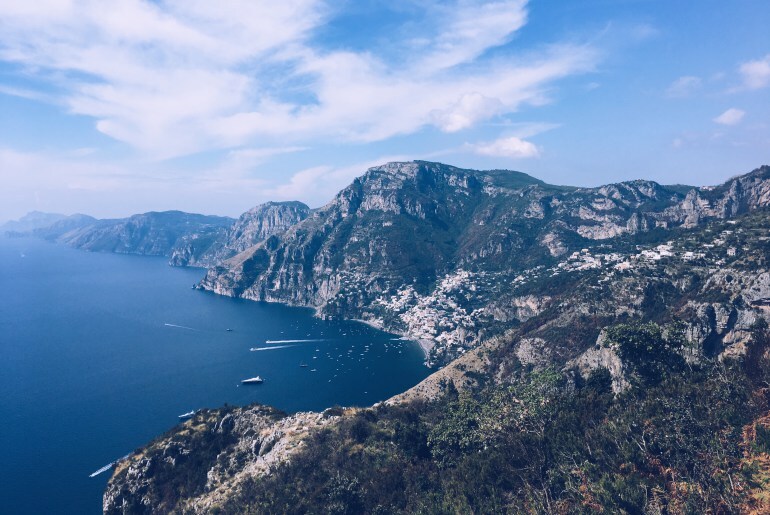 If you’re feeling particularly active, you could walk all the way from Positano to the hamlet of Bomerano in Agerola and take the bus back, but even if you don’t want to hike the whole thing, try to spend some time taking in the spectacular scenery from here. Dedicated to the Apostle Saint Andrew, this 9th-century cathedral is not to be missed. It’s a unique sight, built in the early 1200s, and the architecture is influenced by several styles: Gothic, Romanesque, Baroque and Byzantine. 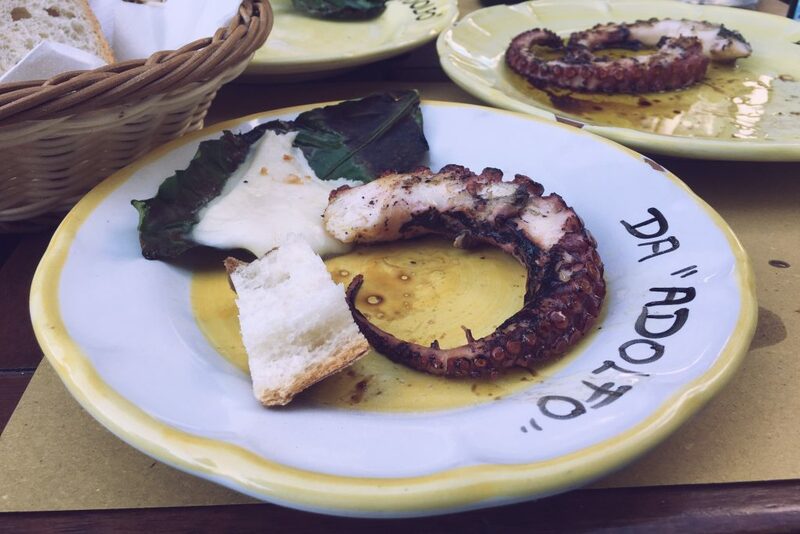 Eating at Da Adolfo is one of the best foodie experiences you’ll have in Positano. Da Adolfo is a seafood restaurant tucked away in a cove where you can swim, relax on a deck chair, and eat to your heart’s content. 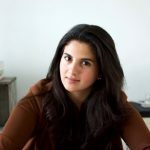 To get there, look for a boat with a red-coloured fish on the flagpole at the pier in Positano that will take you to a lovely trattoria where you can eat grilled fresh fish all while enjoying a private beach. This stunning grotto may be a popular tourist attraction, but don’t let the crowds put you off. The sapphire blue effect within the cave is caused by sunlight creeping through an underwater cavity which is then reflected up to the surface, thereby illuminating the whole cavern. Visitors enter through the mouth of the grotto when the tide is low enough for boats to sail through. Villa Cimbrone is a building that dates back to the 12th-century and was restored as a hotel with many of its original features. The gardens surrounding the villa are said to be beautiful, and one of the must-see attractions of this quaint coastal town. See Also: Italy vs Spain: Which Trip Should You Take? Almost all of Italy lends itself to romance, but Tuscany’s 23,000-kilometres are tailormade for it. Renowned for rolling hills, spectacular countryside, art that has inspired the world, jaw-dropping architecture, culture, history, and influential scientists, this central region is the quintessential romantic and rustic Italian vacation. If your idea of a holiday involves sipping wine, devouring Tuscan cuisine, and exploring affluent cities and ancient villages at the foothills of the Apennines, then read on! To make the most of the weather and to bathe in the glorious Tuscan sun, you should try to visit in April, May, June, September, or October. Although these months are some of the busiest and most expensive, it’s also the best time to travel to the region! If you want all of Tuscany to yourself then plan your vacation from November to March; it might be colder and rainy, but you’ll snag some sweet travel deals. 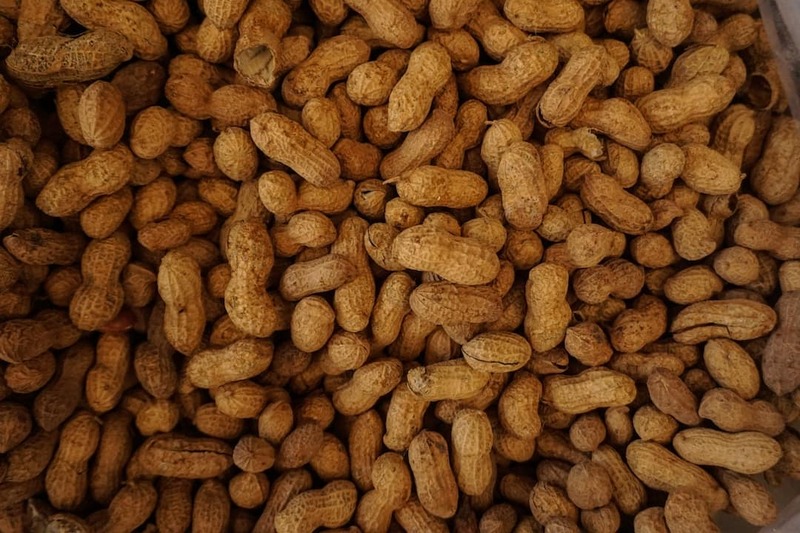 See Also: Tuscany Vs. Umbria: Which Italian Region is Calling for You? Tuscany’s capital is the birthplace of the Renaissance. 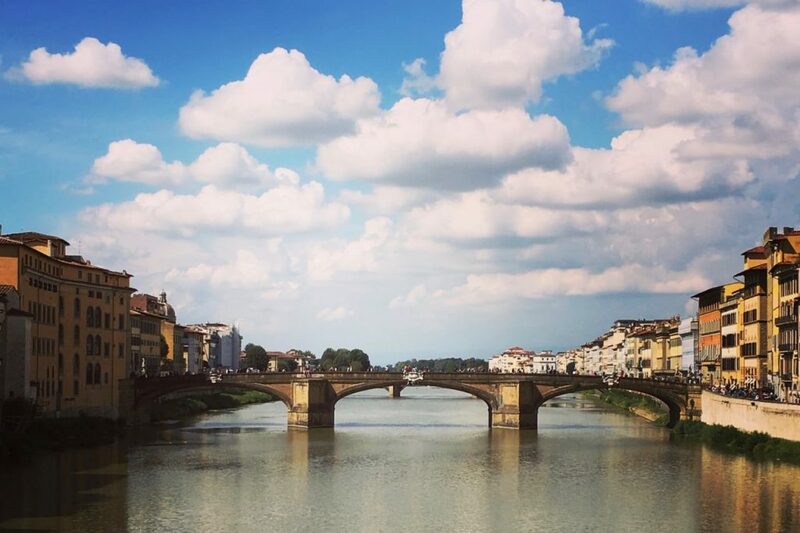 Florence oozes with glorious art, history, wonderful buildings, and culture, and there’s so much to see and do. Make it a point to marvel at the orange-roofed Duomo, walk along the iconic Ponte Vecchio, watch the sunset from the steps at Piazzale Michelangelo, and admire masterpieces at the Ufizzi Gallery by artists like Leonardo da Vinci and Sandro Botticelli. Siena is the Tuscan city from a different time. Medieval brick buildings line winding streets that visitors can lose themselves in. From the Piazza del Campo, Siena Cathedral and historical centre to the nearby countryside, markets and local food and drink, Siena has something for every kind of traveller. Located on the Serchio river, Lucca, the city of 100 churches is full of Italian character and charm. With cobblestone streets, Renaissance walls, and pathways that are perfect for the traditional passeggiata (evening walk) or cycling, just being in the city is a treat. 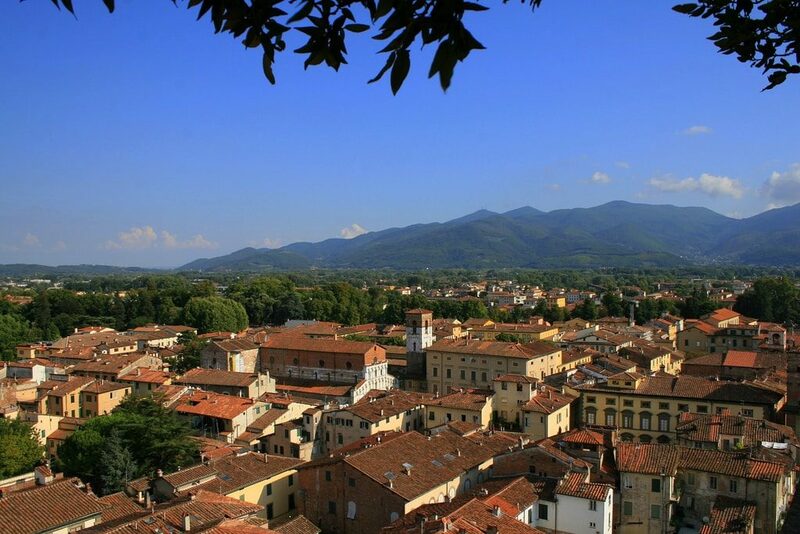 Discover the best panoramic views of the Lucca by walking along 4-kilometres of city walls that were built to protect the city in the 16th and 17th century. To experience a city by the sea, visit Livorno, a picturesque and traditional Italian coastal resort in Tuscany. Granted, there’s less history and art, but you’ll be trading them for il dolce far niente (the sweetness of doing nothing). Explore the Fortezza Vecchia, an old fortress close to the port, and visit Quartiere La Venezia. The quarter is filled with canals and bridges reminiscent of Venice. By all means, come to this region for the vineyards, but also soak in the landscapes, sample the local cuisine, and spend time in the small towns while you drink some of the world’s best wines. If you want to escape the crowds and droves of tourists, step off the beaten track and immerse yourself in ancient Etruscan times by visiting hamlets and settlements at the base of the Apennines. 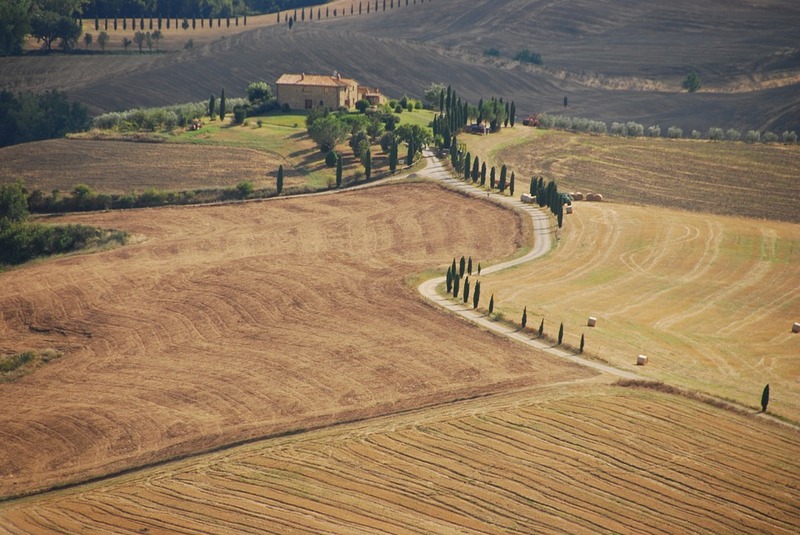 To experience Tuscany, venturing deep into its countryside is a must. Volterra, San Gimignano, Pienza, Cortona, Montepulciano, and Montalcino are just some of the hilltop towns and villages well worth a visit. If you happen to be in Tuscany during September and October, you can experience the grape harvest. Take part in a truly local experience by booking a farm stay. It’s one of the best times of the year, and understandably Tuscan residents look forward to this annual event. The Amalfi Coast maybe home to the Path of the Gods, but Parco Nazionale delle Foreste Casentinesi is a hiker’s heaven. If you want some time out from the city of Florence, or are a trekking enthusiast looking for something close to Tuscany’s capital, this natural beauty is just 90-minutes away by road. 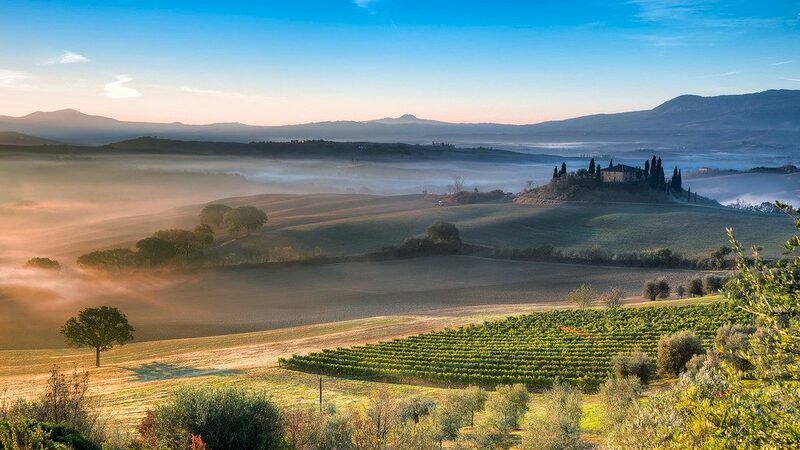 If your dreams of Tuscany involve a picturesque landscape filled with vineyards, olive groves, a road that winds through grassy fields, and rustic villages that beckon artists and poets, Val d’Orcia is where you need to be. This UNESCO World Heritage Site is also home to lots of natural hot springs, another highly recommended local experience. You can’t leave Tuscany without climbing to the top of one of the world’s most famous towers. The panoramic views of Pisa from the top of this leaning town alone are but one reason to climb all the way up. It’s best to buy your ticket in advance for this experience, especially if you’re short on time and want to avoid the lines. Most people associate Tuscany with countryside and remarkable cityscapes, but it’s also got a fabulous coastline filled with sandy shores and fascinating towns. If you only do one thing by the sea then let it be a trip to Elba. 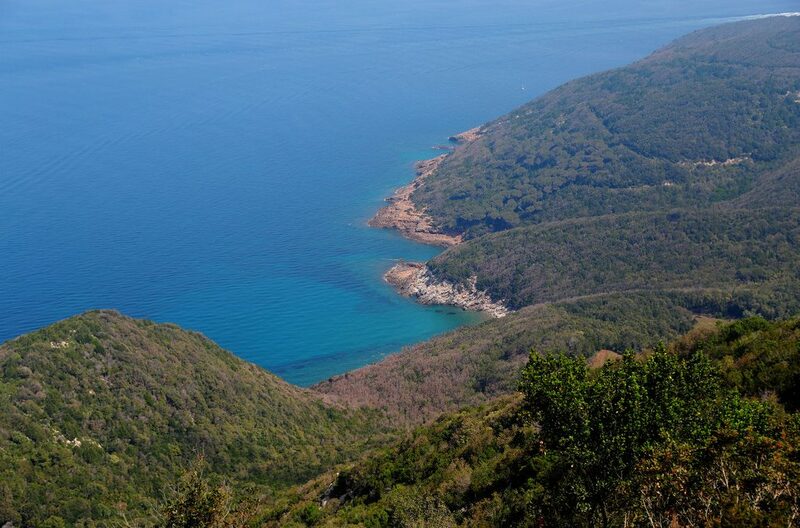 You can reach the island by ferry from Livorno, go for the incredible bays and beaches. No matter where you go in Italy, it’s going to be a treat. 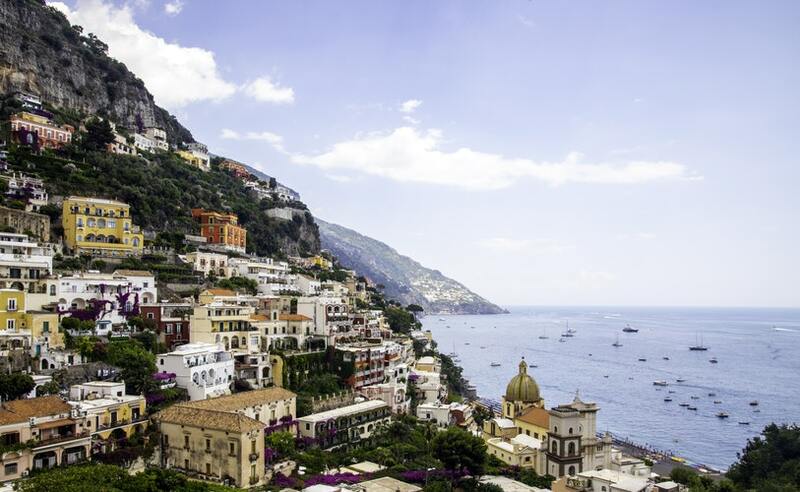 Whether you’re hiking The Path of the Gods, feasting on fresh seafood, or witnessing the famous grape harvest, it will be an Italian adventure to remember forever. Would you prefer to travel to the Amalfi Coast or Tuscany? Cusco vs. Lima: Which City is For You?